News from Ingolstadt today regarding the Q3, formerly known as the Cross Coupe Quattro Project (pictured). Word is, the Q3 will be produced in Spain as of 2011. As for US production? Well, it's been "postponed" as of now. Full press release after the jump! * Audi CEO Rupert Stadler: "Consistent strategy of growth and internationalization through this product and production decision"
A production site for the Audi Q3 was chosen today: the SEAT site in Martorell, Spain. Manufacture will begin in 2011 with an annual production capacity of up to 80,000 units. The total investment will amount to around €300 million. "Following in-depth consideration of all relevant factors and an extensive international comparison of various sites, we selected Martorell," explained Rupert Stadler, Chairman of the Board of Management at AUDI AG. This decision enables Audi to continue its strategy of growth and internationalization. Mr. Stadler added: "We are counting on this Spanish site's efficiency, the excellent quality of the Production department, and its highly trained staff. We will use the Group's synergies to sharpen our competitive edge and help protect around 1,200 jobs. The decision furthermore safeguards workplaces at other Audi locations." Audi Board Member for Production Frank Dreves: "Starting in 2011, the Audi Q3 will be produced to Audi quality standards at the Martorell factory. This gives us additional flexibility regarding future decisions about products. We will begin preparing at once." Having agreed that the Q3 will be manufactured in Spain, a decision about production in the USA has been postponed. Mr. Stadler: "We will systematically explore our options in the context of the current market crisis. Audi is in a good position. There is currently no urgent need to select additional sites." A small, sporty SUV, the Audi Q3 will join the family consisting of the Audi Q5 (produced in Ingolstadt, Germany) and the Audi Q7 (produced in Bratislava, Slovakia). Yet another compact vehicle in a new model range is thus set to join the A1 in 2011. The Q3 will further expand the Q family. A coupé-like five-door SUV with seat positions, wheel size, and ground clearance characteristic of a typical SUV, the Audi Q3 will stand out thanks to a supremely sporty driving experience. The Q3 will blend a compact car's design and driving dynamics with an SUV's spaciousness and versatility. True to Audi tradition, innovative technical solutions will blaze new trails in efficiency, driving pleasure, and comfort. 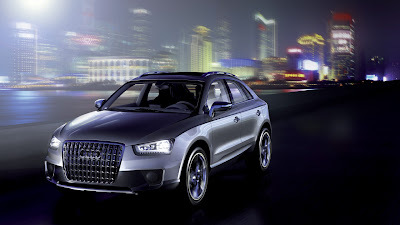 The market launch of the Q3 is scheduled for 2011. The production facility in Martorell is yet another cornerstone in AUDI AG's portfolio of sites. Audi produces its vehicles in Ingolstadt and Neckarsulm (Germany), Hungary, Belgium, Slovakia, India, and China.